Since the total length is 170 mm and short, a brass 7 mm hex rod is press-fitted and used as the total length 600 mm. It is good to have a brush with a total length of 600MM so that you do not have to press-fit a hexagonal rod. This review is about item#34844232. This is the second one. It is useful for rust removal of aluminum fins. I would like you to sell a set of 3 to 5 sets with a reduced price. This review is about item#34844214. This review is about item#34844223. It is very good. I cleaned thoroughly. I want to use it carefully. I am using it to clean the garbage of the evaporator of the car air conditioner. It is! . This review is about item#34844241. 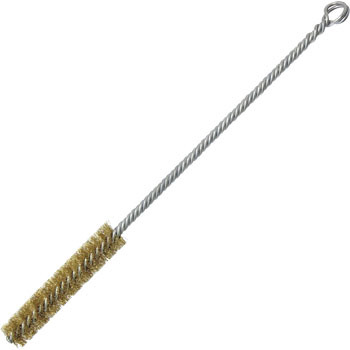 It is used to remove the residue of the liquid gasket that remains in the hole through which the bolt penetrates. There are many cases where this product is not put in the home center etc., and it is saved by being able to obtain by mail order. This brush is used by holding it in your hands, but I also want variations that are attached to rotors and used like rotating. Currently I cut short and use it. Also, if the thickness of the brass wire being used also has a type, the use range will expand further. There is no special thing because it is absolutely no matter where it is. Since purchasing on the Internet buys the convenience to go out without going to buying things that are generally available in general, it is rare to feel something in particular.